Unfortunately today’s As Seen on TV is a memorial. 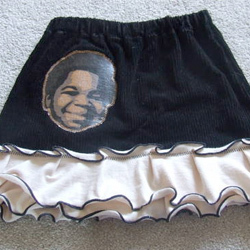 Gary Coleman passed away earlier today so I thought I should pay tribute Craftster style. Dez-igns created this skirt out of corduroy fabric and a thrifted tee. That skirt is adorable! It’s so sad that he died :/ I hope he Rests in Peace!